Former Manchester United great Ryan Giggs said Monday he was “itching” to get back into football after being unveiled as the new Wales boss – his first permanent managerial post. Giggs, who replaces Chris Coleman, revealed he had sought advice from his former United manager Alex Ferguson over the job. The former winger, 44, has been out of football for 18 months since leaving the coaching staff at Old Trafford when Jose Mourinho replaced Louis van Gaal in 2016. “I’m tremendously proud and excited to be the next Wales manager and I can’t wait to get going,” Giggs said at his official unveiling in Cardiff. “It’s a great opportunity and I’m excited. Giggs said he had picked the brains of his former boss at Old Trafford, under whom he spent almost his entire career. Giggs’s first fixture in charge of Wales will be in the 2018 China Cup against the hosts in Nanning on March 22. He had been the clear favourite for the Wales job since he declared his interest last month and the Welsh FA was keen to make the appointment before the UEFA Nations League draw, which takes place in Switzerland on January 24. Giggs, who was in charge of United as caretaker for four games at the end of the 2013-14 season after David Moyes was sacked, spent two seasons as Louis Van Gaal’s assistant coach. His departure from Old Trafford ended a long association with the club where he made a record 963 appearances as a player, scoring 168 goals. 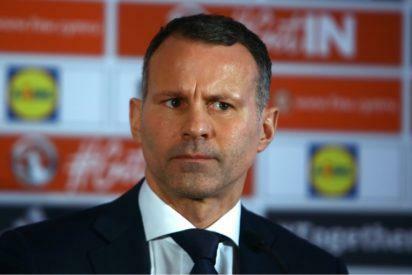 Giggs knows his status as one of Wales’s greatest players is no guarantee he will succeed as the national team’s boss. “It opens doors but so many times it’s been said having a good career as a player doesn’t make you a good manager,” he said. “I’ve got a great group of players to work with who have been so successful over the last four or five years. Who can forget watching us at the Euros? I want to get us back there. Coleman spent nearly six years as Wales manager before leaving to take over relegation-threatened Sunderland in November. He became the most successful manager in Welsh football history when he guided the country to the semi-finals of Euro 2016 — Wales’s first major tournament for 58 years — only to suffer the heartache of missing out on this year’s World Cup finals in Russia. The post Ryan Giggs named Wales boss appeared first on Vanguard News.